1. Blankets. Lots of em. There are Movie Nights and then there are Blanket Fort Movie Nights. Why not add something special by creating an epic fort together. Gather up all the pillows and blankets in your house and make a night your family won’t soon forget! Pro Tip: Use clothes pins and string to hang up Sheets. 2. PJ’s. Getting into your JamJams first is a must. Not only are you more comfy, but when the movie goes late everyone is already ready to hit the hay. 3. Snacks. This is an obvious one, but why not mix it up a bit, Camp Style! Movies will never be the same with this epic S’more Movie Mix! 4. Intermission. Having a scheduled intermission is a must for our kiddos. Bathroom break, Snack refill, and stretch! 5. Theme. Dressing up and decorating brings a movie night to a whole new level! Make sure to pick your movie before hand and give some time for your kids to prepare a costume. 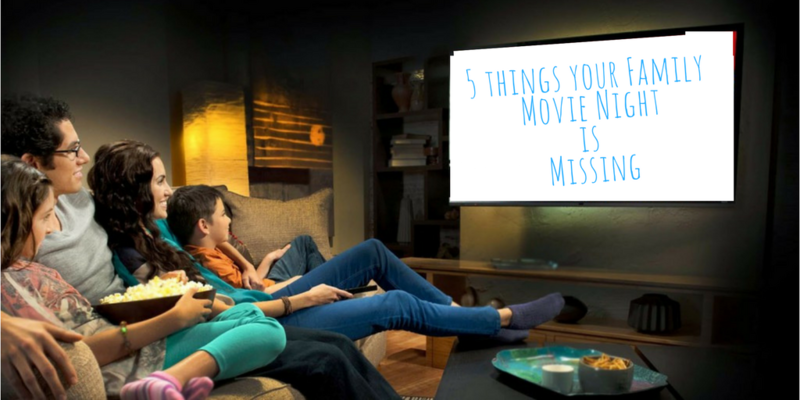 We love this Netflix top 30 Family Movies to pick from!